First up, there are a few more review copies I didn’t manage to get to last time around. I actually flicked through Domenico Starnone’s Ties (translated by Jhumpa Lahiri: published by Europa Editions) just before the MBIP chaos started, but I wasn’t really in a position to give it much thought at the time, so I’ll be rereading it soon for review, particularly given its relationship to Elena Ferrante’s The Days of Abandonment (and the rumours of the links between the two writers…). 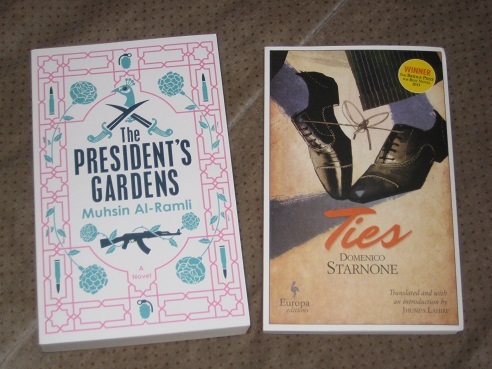 Another book I received just before the Booker longlist announcement is Muhsin Al-Ramli’s The President’s Gardens (tr. Luke Leafgren: MacLehose Press), and while I don’t tend to read a lot of fiction from the Arabic, I’m hoping to find time for this Iraqi novel about the reasons for a good man’s death. Europa and MacLehose have provided a lot of my reading over the past few years, but they aren’t the only publishers whose work I’ve enjoyed before to have sent me books recently. 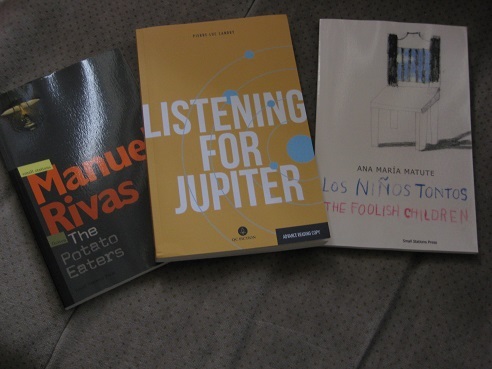 Small Stations Press is a publisher specialising in Spanish and Galician works, and a while back I received two more of their offerings: Manuel Rivas’ short novel The Potato Eaters (tr. Jonathan Dunne) and a bilingual edition of Anna María Matute’s collection of mini-stories, The Foolish Children (tr. María del Carmen Luengo Santaló & Aileen Dever). A little further ahead, I’ll also be looking at the latest addition to the QC Fiction stable, Pierre-Luc Landry’s Listening for Jupiter (tr. Arielle Aaronson & Madeleine Stratford). This is a book I read a couple of months ago, and enjoyed immensely, but I’ll be taking another look at Landry’s intriguing two-viewpoint work for a review to be posted when the book is released in June. 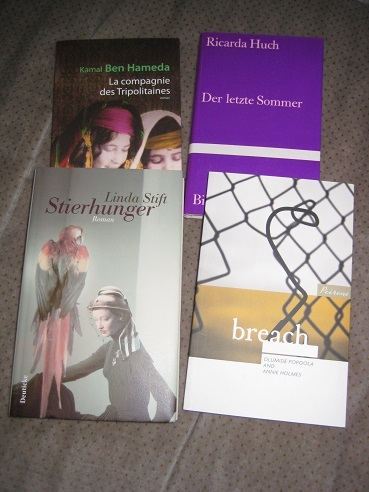 Of course, there are always a lot of my own books hanging around demanding to be read, and that’s especially true for my French- and German-language shelves. 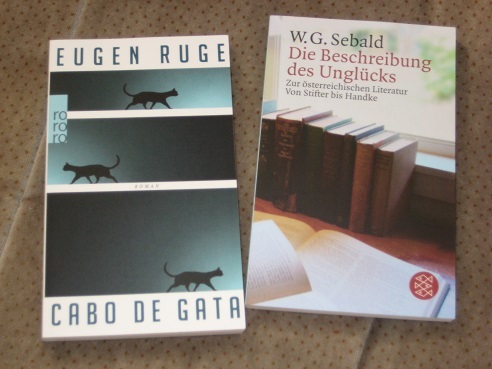 Recent German-language purchases include Eugen Ruge’s novel Cabo de Gata, bought after a recent reread of his excellent In Zeiten des abnehmenden Lichts (AKA In Times of Fading Light), and another addition to my Sebald library, Die Beschreibung des Unglücks. This one, of which the title translates to something like The Description of Unhappiness, is a collection of writings on Austrian literature (obviously cheery stuff), but I don’t think it’s been brought into English yet. I have already figured out that the best way to alleviate the painful awareness of not being able to read all the books you have is to buy more books. 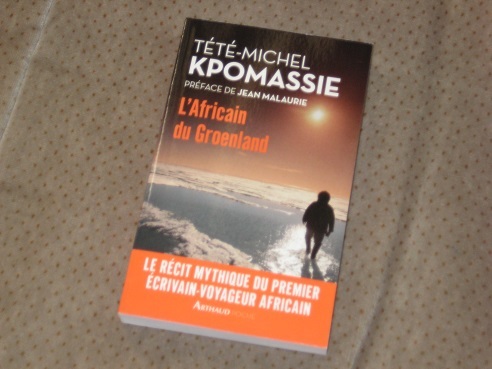 The Untranslated – That’s the last thing I need at the moment! You always have such an interesting looking TBR, though…. Kaggsy – But a TBR list means you’ve got to read them at some point (which is why I’ve *tried* to limit it!). 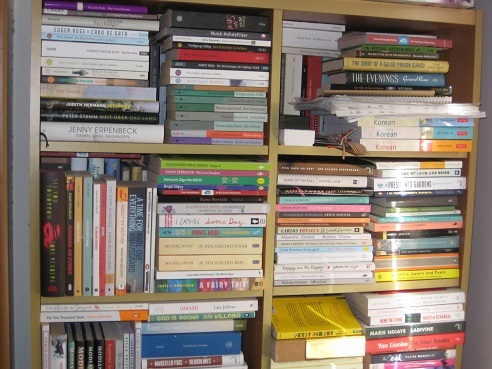 Well, that’s the theory – with the amount of books I have, actually putting it into practice might be difficult…. Wow! How exciting- in what way?! ps: Of course I’m curious of your findings of part 5 of Proust. Now, that’s something great! Looking forward to your thoughts on all of these, Tony! Ah, great – thanks. Well I look forward to that one especially and whatever else you get around to. I’m always torn between reading about books and actually reading books!